The Deluxe Delection is a fireplace that is also a work of art. Hand-carved from solid, natural, Portuguese limestone, this chimney piece features modern, straight lines and soft, sensual curves. 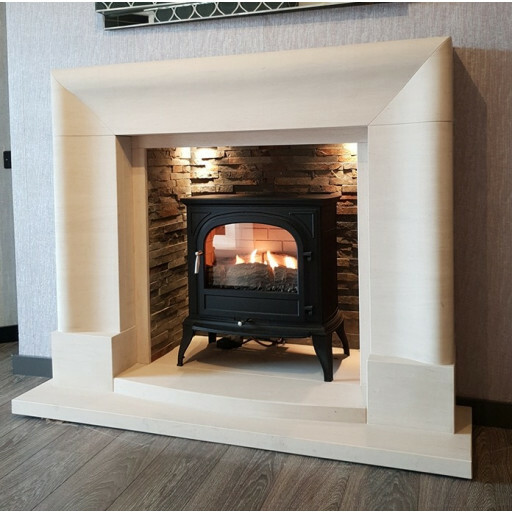 Its large, bowed, solid-stone hearth steps up to a wood-effect ceramic chamber. When the fireplace is not in use, turn on its two, switchable, halogen down lights to enhance and show off the stylish chamber's features. The Deluxe Delection, however, serves as a showpiece even when it is not in use and its halogen lights are off. This fashionable fireplace constructed of quality, light-toned limestone suits the decor and colour scheme of any home. The fireplace stands 1260 mm tall from the bottom of its base to the top of its mantel. The mantel is 1420 mm in length, and it measures 215 mm from its back to its front. Longer and deeper than the upper part of the fireplace, the base of the Deluxe Delection is designed to provide stability for the entire unit. The base is 450 mm deep at the outermost portion of its curve. The fireplace's hearth is 925 mm wide and 875 mm high. The Deluxe Delection is available through financing to qualified buyers. Free delivery of the fireplace is provided in mainland UK. The unit comes with a 1-year warranty. Simply beautiful fireplace,looks even better in our living room than it did in the showroom,worth every penny ! !